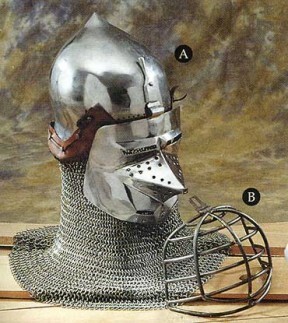 The snout-like form of the visor and the pointed helmet-bowl gave this type of bascinet the name "houndskull". The articulated face defense emerged as a novelty during the early 14th century, in the second half of which the visored helmet became an accepted part of the military dress of the aristocracy. Artificial peculiarities were the artistic ideal of the time and so the armourers combined fantastic round visors (in Western Europe) or pointed visors (in Italy and Germany) with the pointed bascinet. From 1400 a new artistic epoch had a different ideal, to which the close configuration, the beautifully smooth shape, the harmonious gracefully changing contours of the Coburg bascinet bear witness. The German armourer who created them knew how to please his customers. The aesthetic attraction of its modeling and finish and the even blue of the surface remain unchanged to this day. From the constructional point of view the German master's habit of suspending the visor in the middle of the forehead is more ancient than the contemporary Milanese armourers' method of fixing it at the sides so that the visor pivoted on its axis. It is interesting to note that the German knight concealed the accompanying mail that protected his body to a far greater extent than did the Italian uorno d'arme. It was usually hidden underneath a pleated coat, reaching to the knee and with voluminous sleeves. Worn over it, the shining breastplate had to act as gleaming decoration against the colorful mass of fabric, giving eloquent expression to the common European "International Style" that so loved richness and color. if I don't miss my guess, isn't this piece pictured in a couple places in TOMAR? An attempt has been made by Deepeeka to reproduce this particular helm. I wonder if the "pig-face" basinet can be called of "italian style and production" or was it produced all over europe. I think that the "pig-faced" basinet is a contemporary of the "hound-face" basinets, but I am not clear on whether they were made at different armour centers (e.g. Italy and Germany respectively). Interestingly enough, these "pig-faced" basinets seem to be fairly rare. There are only 2 in England (as of 1962), one being the famous example in the Wallace collection (of italian make, I think dated 1390 to1410). There is one example in the Met museum in New York (Italian, dated to 1400). There are more surviving examples on mainland Europe, probably prime example being in the Castle of Churburg (I would not be surprised if it were of italian make as well). The hounskul or pig-faced visor (these are two terms that refer to the same style of visor) was produced throughout Europe. However, while the side-pivot version of this visor style was produced throughout Europe, the klappvisor appears to have been manufactured almost solely in central Europe. The only evidence, that I am aware, of this style of visor in England is a decorated window in small town in northern part of the country, I believe.... the name of the town escapes me at the moment. The reference for this is in The Visor of a 14th Century Bascinet found at Pevensey Cathedral (Mann, Sir James G.). I would look the name up for you, however this particular article from The Antiquaries Journal is suspiciously missing from my bookshelf! To my knowledge there are at least 4 examples of a pig-faced side-pivot visors in England. These are all in public collections. There is no telling what exists in the hands of private collectors and possible out of the way churches, museum, etc. The Metropolitan Museum of Art has 4 examples in their inventory, with at least one bowl that retains the hinges used to mount a side-pivot visor. The Art Insitute of Chicago has one example, not on display. Also, Philadelphia has an example (not sure if this is on display or not). Also, at least one example is know to exist in the hand of a private collector in the US... there is probably more, but this information is near impossible to obtain. This is off the top of my head, there may certainly be more. Throughout the US and England, I am aware of at LEAST 42 examples of existing pig-faced visors with side-pivots. There are a significant number of bascinets that have holes and/or hinges remaining for the "side pivot" visors, also. There also exists basinet visor fragments, such as the one in Musée Nationale du Moyen, that may have been side-pivot visors, as well. Given the number of surviving examples and the sheer numbers in which the side-pivot visor is represented in art we can comfortably say that it was, most likely, the most common style of bascinet visor. Also, Philadelphia has an example (not sure if this is on display or not). 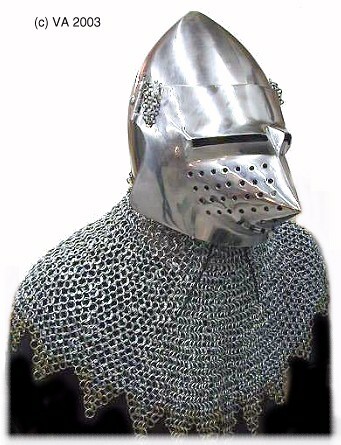 The snout-like form of the visor and the pointed helmet-bowl gave this type of bascinet the name "houndskull”. The terms "houndskull" or "hunskul" or "hound skull" normally refers refers solely to the visor style, not that of the basinet as a whole. Also, the term has been largely replaced with "pig-faced". For instance, that Veste-Coburg bascinet pictured could be classfied as a mosque or onion-domed basinet with a pig-faced klappvisor. Artificial peculiarities were the artistic ideal of the time and so the armourers combined fantastic round visors (in Western Europe) or pointed visors (in Italy and Germany) with the pointed bascinet. Existing round visors (of which there are few) are all attributed to Switzerland, Germany, Poland and Italy, I believe. Thus, the statement of them existing in Western Europe while pointed visors existed in Italy and Germany is largely misleading. All of these round-faced visors that exist today are klappvisor style mounts... save for a few odd examples that are side-pivot and most of those are more of a flat face than a rounded. There are a number of documented sources for pig-faced bascinets through France and England and little on round-faced in these geographical locations, to my immediate knowledge. I could be missing something, but the pig-faced visor appears to be much more common throughout Western Europe, especially if you are counting England. As noted above, the klappvisor mechanism for mounting visors is primarily known to have existed in Germany and Northern Italy (Milanese). Thus, the majoirty of the visors in England would most likely have been side-pivot with the round-faced klappvisor being primarily located in and around Central/Northern/Southern Europe. From the constructional point of view the German master's habit of suspending the visor in the middle of the forehead is more ancient than the contemporary Milanese armourers' method of fixing it at the sides so that the visor pivoted on its axis. I am truly interested in the source for this bit of information. It has always been my understanding that they existed in tandem, with the center-mount living well into the 15th century, as seen on early Italian barbutes. I am unconvinced, at this time, that evidence exists to truly put one before the other. Also, the side-mounted visors were manufactured throughout Europe and not solely a product of 14th century Milan. The Milanese were also producing the center-mounted visors. I believe numerous examples of evidence exit today to support this theory. Your thoughts on the subject? Just to be clear here, these topics aren't intended as articles per se but rather just posts on a forum. Our articles are in the features and hands-on reviews sections of this site. The copyrights for these topics are all listed at the bottom with their sources, when applicable. These little "profiles" of antiques are intended to spur discussion and bring out the people, like yourself, who really know what they're talking about on these subjects. This particular excerpt is from Thames and Hudson, London but was originally published by Keysersche Verlagsbuchhandlung, Munich, 1963. the same text has appeared in many publications since then, including Arms and Armour of the Western World, McGraw-Hill, New York, 1964/1972. Regarding the center-pivot predating the side pivot, I have nothing to add here as I have not personally researched this issue. I will say that a Royal Armouries UK Yearbook had an article several years back that brought this up. It might be worth finding those old yearbooks and searching for the article. I do not have access to that one so do not know the year. There is also a German book about helmets (title unknown to me at this point) that discusses these in detail, but not being able to read German I wouldn't know what they concluded. Thank you so much for adding to this subject. It's exactly what i am hoping for in posting these things. I'd like to read more if you have it and see more examples of the center pivoting visors like this. I'm particularly interested in styling variations. Ah... that explains it. The true study of bascinets as their own individual subject is currently in its infancy. Back in the 60's it was a twinkle in Father Research's pants. Some of the better research on the subject has yet to be published. It is literally astonishing how many examples are known to survive to date and the variations in style, shape, function that exist/existed. I will do my best to assist in spreading my admittedly limitted knowledge in the field. Erik turned me towards this board a while back and thus far I have been very satisfied with the content read. As Erik is focussed on mail, I am strictly focussed on European armour from the 14th century... so I will have little to add outside of that context. However, I am out to learn more and teach what I can. I applaud you for your effort on this board... excellent work! Notice the squared/faceted exagerated point... I find that especially interesting. 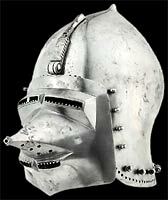 There is also a poor picture of this helm in Laking's 7 Centuries... it is covered in Volume 1, pp. 243-244, fig. 283. It was acquired by the Met in 1904 from the Duc de Dino collection. Dr. Alan Williams discusses this helm in his book The Knight and the Blast Furnace, also. I believe it to be made of wrought iron. I will have to double check and verify this little tidbit of info, though. The Metropolitan Museum of Art has 4 examples in their inventory, with at least one bowl that retains the hinges used to mount a side-pivot visor. The Art instiute of Chicago has one example, not on display. Also, Philadelphia has an example (not sure if this is on display or not). Also, at least one example is know to exist in the hand of a private collector in the US... there is probably more, but this information is near impossible to obtain. This is off the top of my head, there may certainly be more. The number quoted (only 2 pig-face basinets in England) comes straight form the Wallace collection catalogue from 1962 in the description of the collection's own pig-face basinet. In my own little research, I only found the Wallace collection and the Royal Armories examples from England which confirms what the Wallace catalogue was saying. Again, thing might have changed since 1962, and it is somewhat hard to follow these things, as the literature concerning basinets is not always readily available. Yes, the basinets were commonly used, but the argument is that there are not a whole lot of them preserved. This makes them a very highly praised items for the collectors. This argument was again put forth in the Wallace collection catalogue from 1962. I am avery happy to see that there is research being done in this field as I am very interested in knowing about the subject of basinets in the 14c. Most sources in which I've seen this bascinet published have listed it as early 15th century (usually 1400-1410). However, the most recently published source I've seen that shows it, (the 1996 catalogue of the Churburg Armoury by Mario Scalini which uses it as an example), calls it c. 1385. Does anyone know if the date has been revised or did Scalini use old or unusual info? By the way, I love this bascinet. Does anyone have an answer to my question above? I wish I had an answer for Chad, but this is more of a generic comment. I hope I am not stirring up a hornet's nest here but I would like to challenge this concept of there only being a few rare surviving examples of Houndskull bascinets, etc. ( not to mention other types ) I have been web-researching A & A again for the last three months and this time I have collected everything by Museum, Castle and Collection and I am currently up to 704 folders . (.ie Museums, etc.) and I know I have only scratched the surface. We, as Westerners, tend to get fed, and indeed only get good access to that which is popular in the west. But there are hundreds of Museums and Castle collections out there containing not only Bascinets but items that I had only previously seen in Period art ( not to mention things that I have never seen before ) These are many items in Castles that are not on the popular tourist route. Indeed, some places are only just getting a fledgeling tourist industry. Many armouries contain items that have never left the local area and clearly bear the Town or district's armouring-Stamp. I may be able to make a list of bascinets in Museums ( eventually) so then I would be able to put my money where my mouth is.......and I know this is a bold statement, but I am prepared to say that IMHO there would be in excess of 45 original Bascinets with "visors" ( of the pointy kind) in various states of preservation. ( Not counting those questionable items on the back shelf !) Thats my new line of thinking after three months of daily research, much of which has looked towards Eastern Europe. I have also found many amazing items a lot closer to home but just not on display in major museums and therefore not greatly photographed. You all most probably know that if you search the words " Museum Armour" in English the results wil be entirely different for each foreign language that you use with the same words.....eg. " Оружейная палата " means the "state armoury "(Kremlin) ....so if you copy and paste that term and do a search using it, you'll get all the Russian results that are not in English. Anyway, I am sure that most of you already do this. And then theres all those great East European books ! ( I cant keep up with or afford most of the Western ones ! ) Ah well, as they say..." a picture is worth a thousand words"
All the very best and happy hunting ! "Then let slip the dogs of war ! "......Woof ! 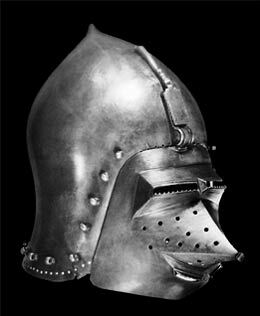 To the best of my knowledge , there are three examples in the Royal Armouries, the famous ex Churburg 'pig faced' bascinet, (IV. 470). with its aventail still in situ. And there are also at least two bascinets with Klappvisors in the collection as well. IV.467, which is shown in A&AOTMK, p 69. And IV.6 , Here I think there is some doubt as to its country of origin. I had always thought that Klappvisors were a peculiarly German feshion, but this one is thought to be possibly Italian. and I know this is a bold statement, but I am prepared to say that IMHO there would be in excess of 45 original Bascinets with "visors" ( of the pointy kind) in various states of preservation. ( Not counting those questionable items on the back shelf !) Thats my new line of thinking after three months of daily research, much of which has looked towards Eastern Europe. 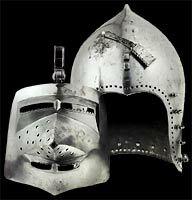 Even if there were 100 surviving bascinets, that would still be a small number compared to the number of surviving examples of most other helmet forms. Bascinets and non-frog-mouth great helms seem to survive in far fewer numbers than many other helmet forms. Our spotlight article lists around 45 surviving examples, though, irrespective of visor type (if a visor is even present), so I wouldn't be surprised if there were 45 just of snouted bascinets counting what we have and what you've found. Interesting to speculate on, but I'm really more curious about the dating of this helmet. To date I have cataloged 175 authentic bascinets or visors, or portions thereof. In this process the dating is the most difficult. The dating of bascinets has lead to many fiery discussions. Scalini's date may be correct but I suspect the early 15th century date may be more accurate. Scalini does have a tendancy to provide earler dates than most other armour schollars. 1385 is the traditional date for this helmet but the first decades of the 15th century date is the most commonly accepted date today. Make of it what you will. We will never know.